TALLMADGE, Ohio (AP) — On a recent chilly evening in Tallmadge, the Venue Banquet Center was mostly empty as the oldest big band in Akron prepared for its Spring Gala. The Moonlight Serenaders were founded in 1951 and have been keeping the hits of the era alive for 68 years. The 20 members’ ages and tenures span a wide range, but only one has been on the bandstand for the group’s entire history. “They had to get a special dispensation … so Mona could play with them,” said band publicist, producer and alto and baritone saxophonist John Smith. Just as her mother and aunt passed down the musical genes, Schaeffer taught her daughter and granddaughter. She’s proud that her granddaughter works in the music department at the Library of Congress. Anyone looking for her full resume won’t get it from Schaeffer. “I’ve been in so many bands, I can’t remember them all,” she said. She counts jazz icon Louis Armstrong and Wynton Marsalis among her favorite trumpeters. Mother Nature was in a foul mood on the night of the show, and the rain was continuous. But a little sky water couldn’t stop the packed house of dancers and music lovers, some dressed in evening wear, others rocking a more casual look. They came as couples and in groups, some with wheelchairs, walkers or canes, all ready to enjoy the music they’ve loved for decades. Second altoist Allison Antalek, a relative newcomer, was also celebrating after enduring 20 operations on her foot. The former competitive dancer determinedly left the bandstand to cut a rug during the Serenader Sisters’ peppy rendition of “Boogie Woogie Bugle Boy,” dancing for the first time in several years. Robert Feldbush, the longtime music director for Cuyahoga Falls High School’s Gold Tones jazz ensemble who taught nearly half the current Serenaders, guest-conducted a few numbers. After a short break, the uptempo dance set got the joint jumping. Schaeffer swung the lead melody of “Tuxedo Junction,” and dapper singer Bruce “Mr. Excitement” Ballard’s gritty takes on “Blues in the Night” and “Mack the Knife” drew cheers from a lively group of ladies from the Inn at Belden Village. When the show ended, pianist Ruggles, a self-described rock ‘n’ roll and blues player who joined the Serenaders about three years ago, talked about the band experience. Trombonist Al Mothersbaugh calls joining the Serenaders “the best thing I ever did. … There’s a lot of big bands in this town but nobody has more heart than this band because we all care about each other. The fact that we have heart, that’s what makes people go bananas,” he said. “I’m tired. This was a long one for me,” she said while packing up her trumpet. 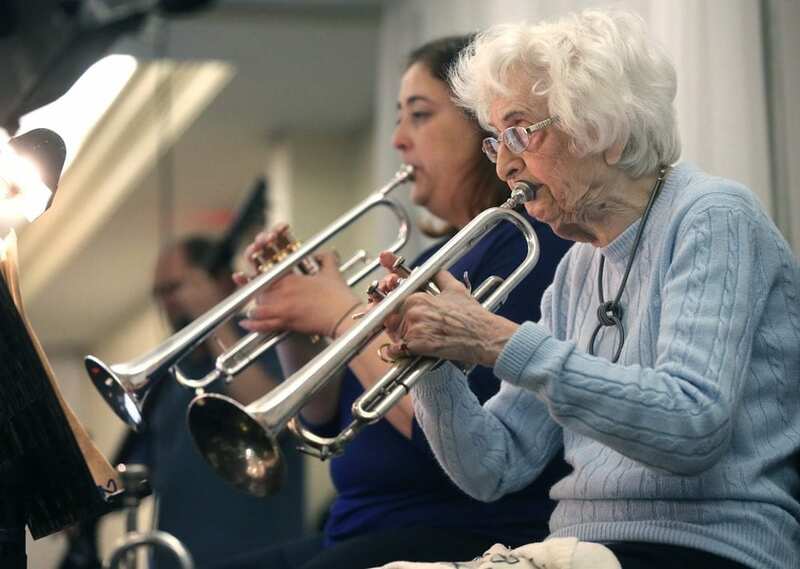 Be the first to comment on "Ohio Woman, 96, Still Swings On Trumpet In Band Founded In 1951"